The name “cobra” originates from the Portuguese “cobra de capello,” which means “snake with hood." Cobras are members of the Elapidae group—a family of snakes with hollow, fixed fangs. All 30 cobra species are venomous and possess neurotoxic venom. The fearsome cobra family is divided into seven distinct genera. The Naja genus represents around 20 cobra species, making it the largest, most widespread taxonomic group. One of the most common snakes in the group, the Indian cobra (Naja naja), features a black band on the underside of its neck and half-rings on either side of its large hood. Though generally reclusive, when threatened it assumes the characteristic elongated cobra posture and can deliver a highly venomous, deadly bite. The following species make up the rest of the Naja genus: Naja anchietae, Naja annulifera, Naja ashei, Naja atra (commonly known as the Chinese cobra), Naja haje (Egyptian cobra), Naja kaouthia (monocled cobra), Naja katiensis, Naja mandalayensis, Naja melanoleuca, Naja mossambica, Naja nigricollis, Naja nivea (Cape cobra), Naja nubiae, Naja oxiana (central Asian cobra), Naja pallida (African cobra), Naja philippinensis (Philippine cobra), Naja sagittifera, Naja samarensis, Naja siamensis, Naja sputatrix (Indonesian cobra) and Naja sumatrana. The Ophiophagus genus contains a single cobra species, but it’s one of the largest venomous snakes in the world, the king cobra (Ophiophagus hannah). Found throughout the rain forests and plains of India, China and Southeast Asia, the king cobra can reach up to 18 feet in length. It can deliver two-tenths of a fluid ounce in a single bite—enough to kill 20 people, or a full-grown elephant. The Aspidelaps genus represents the shield cobras: the Cape Coral snake (Aspidelaps lubricus) and the shield-nose snake (Aspidelaps scutatus). They have short, stout bodies seldom reaching more than 2 feet in length. Shield cobras are more streamlined and have smaller hoods than their counterparts in other genera. They also possess less venom due to their smaller size, but should still be avoided and treated cautiously. The Boulengerina genus represents what are commonly known as “water cobras.” The two species in this group include Boulengerina annulata (the ringed water cobra) and Boulengerina christyi. Typically aquatic, these venomous snakes inhabit rivers, streams, lakes and swamps throughout Africa. 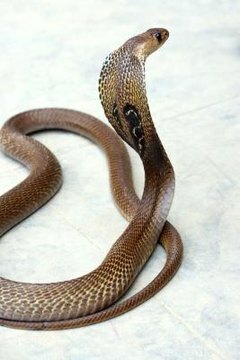 Only one cobra makes up the Hemachatus genus, the ring-necked spitting cobra (Hemachatus haemachatus). Found throughout southern Africa, this cobra does not actually spit venom as its name suggests; when threatened, this snake squeezes muscles on its venom glands, ejecting venom up to 6.5 feet. The arboreal “forest cobras” of the Pseudohaje genus prefer to spend their days and nights in the trees of western and central Africa. The Gold’s tree cobra (Pseudohaje goldii) and the black tree cobra (Pseudohaje nigra) are some of the most agile, venomous snakes in Africa. The desert cobra (Walterinnesia aegyptia) and the more reclusive Walterinnesia morgani round out the cobra family. These medium-size black cobras inhabit much of the Middle East from Egypt to Saudi Arabia. What Kind of Climate Do Cobras Live In?